Michelle Wong, MD graduated with distinction from George Washington University School of Medicine and completed her residency training in Obstetrics and Gynecology at the National Naval Medical Center in Bethesda, Md. Dr. Wong is Board Certified in Obstetrics and Gynecology with a wide range of clinical interests including routine obstetrics and gynecological care, high-risk pregnancies, pregnancies complicated by health conditions (i.e. gestational diabetes, hypertension, or other pre-existing conditions), minimally invasive surgery and basic infertility. Her passion is caring for adolescents and helping soon-to-be mothers and women of all ages develop healthy habits and lifestyles. Dr. Wong received the Army Achievement Medal for “Outstanding Patient Satisfaction” and was named by Houstonia Magazine as one of Houston’s Top Doctors in Obstetrics and Gynecology. 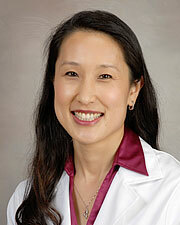 Dr. Wong and her husband live in the Sugar Land area with their two sons. She is an active volunteer in Fort Bend ISD and enjoys reading, eating great food and spending time with her family. Dr. Michelle Wong graduated with distinction from George Washington University School of Medicine and completed her residency in obstetrics and gynecology at the Walter Reed Army Medical Center and the Walter Reed Army Medical Center in Washington, D.C.
Board certified in obstetrics and gynecology, Dr. Wong’s wide range of clinical interests include routine obstetrics and gynecological care; high-risk pregnancies; pregnancies complicated by conditions such as gestational diabetes, hypertension, or other pre-existing conditions; minimally invasive surgery and basic infertility. Her passion is caring for adolescents and helping soon-to-be mothers and women of all ages develop healthy habits and lifestyles. She received the Army Achievement medal for “Outstanding Patient Satisfaction” and was named by Houstonia Magazine as one of Houston’s Top OB/GYN physicians. Dr. Wong and her husband live in the Sugar Land area with their two sons. An active volunteer in the Fort Bend ISD, she enjoys reading, eating great food and spending time with her family.